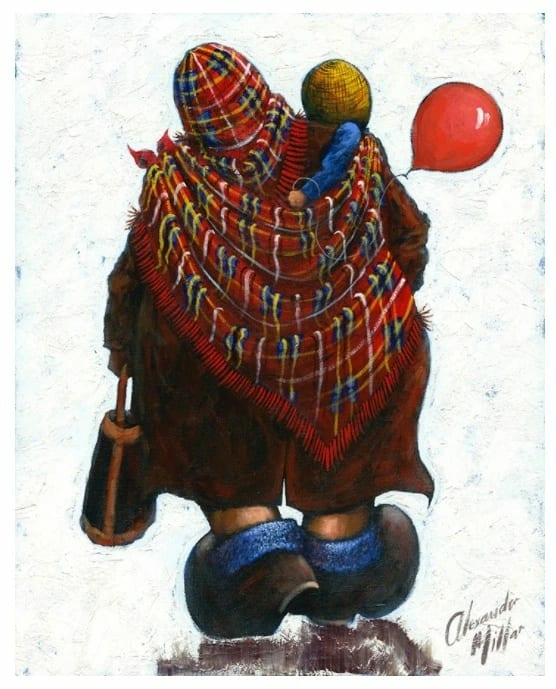 Alexander Millar is one of the UK’s most popular working artists. His highly collectable work hangs in private collections and public galleries worldwide, and his critical reputation is only growing. Millar is known for finding the extraordinary in the ordinary details of day-to-day life. He often draws on his working class upbringing in Scotland for his work, mixing thick brushstrokes with lighter touches to capture his memories on the canvas. 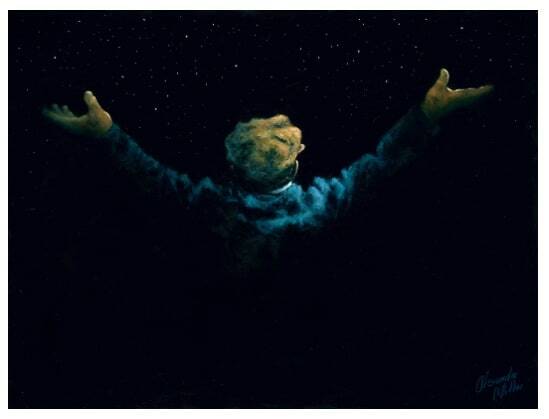 Visit our Alexander Millar artworks page to browse our collection of the contemporary icon’s artwork. Alexander Millar was born in the small mining town of Springside, near Kilmarnock on Scotland’s west coast in 1960. On his time growing up in Springside, Millar says he was fascinated by the small details of life, standing in awe at “something as insignificant as an old man getting off a bike.” This eye for wonder is evident in Millar’s work throughout his career. His father worked for British Rail, and Millar spent a lot of time with him at local train stations, which he describes as the most romantic, nostalgic places to be. Millar senior was also initially unimpressed with his son’s choice of a career in the arts, arranging for him to take on an apprenticeship as a joiner. The artist described this experience as “me in the corner with a skull reciting the sonnets of Shakespeare while there’s guys scraping their knuckles along the ground”. However, it was to be the labourers he knew from building sites which would prove to be one of his biggest artistic inspirations. In 1976, Millar left school and moved south of the border to Newcastle-Upon-Tyne. In Newcastle he bore witness to more working men and women going about their daily lives in what he saw as almost a “choreographed dance routine.” Millar turned his hand to a string of different jobs for his first twelve years in the city, until he decided to pursue artistry full time in 1988. Since Millar is completely self-taught, he has a unique and idiosyncratic style that draws on his sense for atmosphere and tendency to see the wonder in the smallest of moments. His first paintings began to explore his trademark ‘Gadgie’ characters — large working men in coats and flatcaps, often with children, almost always with their backs to the viewer. The bulky shoulders and oversized shoes of these characters emphasise the industrial nature of Millar’s surroundings. He also worked on landscapes, focusing on the factories these characters would frequent. Millar’s paintings have been praised for their intimate truths, portraying the uniqueness of the post-WWII era with sensitivity and optimism. His emotive manipulation of size and proportion brings a playful element to his work, and creates a sense of childlike wonder at the everyday heroism of his working class figures. Millar’s first show was put on by ARTeries Gallery in Glasgow, which came about after he cold called the venue with a collection of canvases in the boot of his car. The show proved so popular that every one of the fourteen paintings he brought to the gallery sold out in thirty minutes. Eventually Millar entered his work into the ‘Not the Turner Prize’ competition ran by a popular newspaper, where he was selected as a finalist out of some ten thousand entries, winning the chance to exhibit his work in London. After that, his work began to be shown all over the UK. Some of his most famous paintings include ‘Cowboys’, ‘Happy Days’ and ‘The Wonder Of It All’. Millar’s work struck a chord with the British public, capturing the hearts of many. His paintings grew in popularity, as epitomised by the recent sale of the original copy of ‘The Wonder Of It All’ for £100,000. This sale came about through the highly unlikely—though fitting, considering the origins of his first show—process of being cold called by a collector. This makes Millar one of only five Scottish artists to have sold a piece for such a price in the past decade. In April 2018, Millar’s exhibition ‘Everyday Heroes’ became his first collection to be shown in America. The works contained within ‘Everyday Heroes’ apply his Gadgie figures to the unforgettable images of first responders to the September 11 attacks on the World Trade Centre in New York, who Millar described as “an iconic representation of the spirit of New York”. ‘Everyday Heroes’ was extremely popular, with people travelling from across the United States, and even from the UK, to see the artist’s first stateside exhibit, eventually earning Millar a gallery on Fifth Avenue, which opened in October 2018. He also donated 20% of his earning from one of the pieces in the collection to both the FDNY’s Vulcan Society Of Black Firefighters and the NYC Fire Museum, where ‘Everyday Heroes’ was first exhibited before moving to a pop-up gallery in the city’s prestigious art district of SoHo. 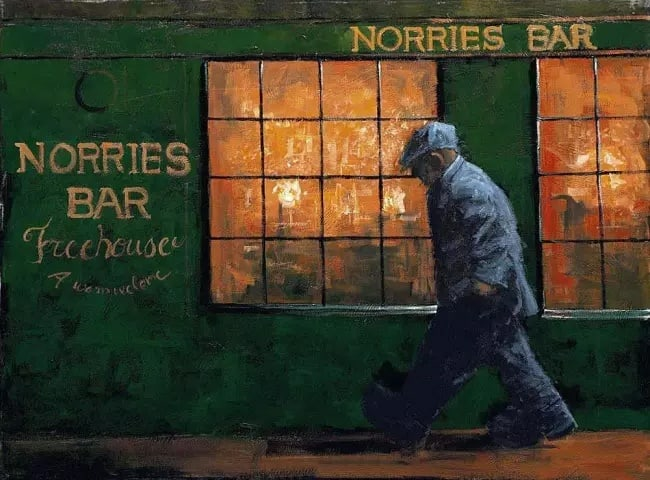 Alexander MIllar lives and works in Jesmond in Newcastle Upon Tyne, where he can often be found nursing an espresso and sketching the people he sees passing by his favourite cafe.